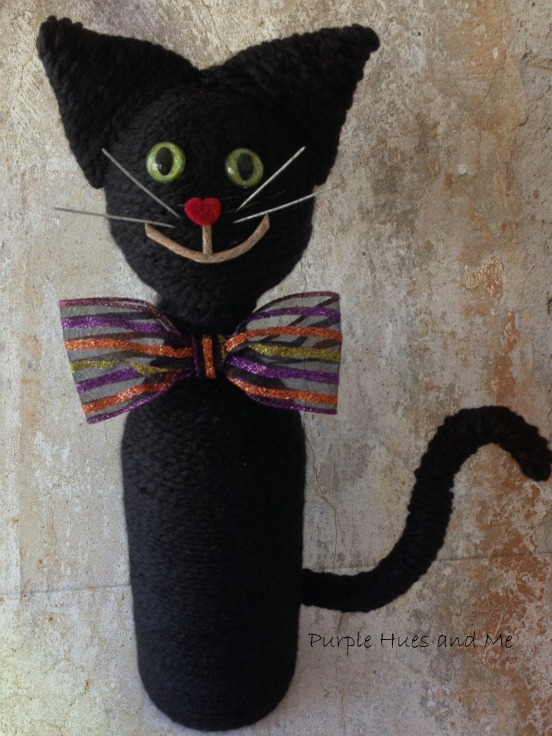 For all those crafty cat lovers out there, it's not too late to make this adorable, easy to make cat for Halloween! Would you believe that it's made using a wine bottle and yarn! You will also need a Styrofoam ball, double sided tape, cardboard, chenille stems, faux animal eyes, felt, stem wire, twisted paper, ribbon and a hot glue gun. And I bet you already have most of these items in your stash! How cool is that! Let's begin by taking a clean, dry wine bottle and . . .
applying double-sided tape up and down and around the bottom portion. Leave the bottle neck free of tape for now so that you can hold the bottle while wrapping the yarn around it. Press the end of the yarn on top of the tape at the bottom of the bottle and start wrapping the bottle with the yarn, making sure to get the yarn close together, with no gaps, as you wrap. Continue wrapping the bottle until you reach the neck portion. Then apply more double-sided tape to continue wrapping the neck. You can stop wrapping the neck just below the bottle opening, sealing with the tape or hot glue and cutting off excess yarn. Press down the center of the Styrofoam ball onto the bottle opening. Use the markings to remove the foam inside of the ball so that it can fit down on the bottle neck. You can actually make the hole in the Styrofoam ball before wrapping the bottle, but you will have to adjust it a bit more to accommodate the yarn if you do. Cover the ball with double-sided tape, up and down and around. Then roll the end of the yarn in a circle and apply on top of the tape at the center top of the ball. Continue wrapping the ball, around and around until . . .
reaching the bottom of the ball. Secure yarn with tape or hot glue and cut off excess. To make the cat ears, use the ball as a guide for the curvature and make a pattern using cardboard and cut out two pieces. Cover the cardboard ears with double sided tape and begin wrapping at the top ear tip. Continue wrapping ears until they are completely covered. Secure end with hot glue and cut off excess yarn. Attach ears to head with hot glue, holding in place until glue is set and dry. Have fun creating the cat's face! To make the cat's tail, group several chenille stems together. Add a dab of hot glue on the end and press the end of yarn down on top and begin wrapping the stems together with the yarn covering all of the chenille stems, down to the end and back up again. For fullness, I wrapped the tail three times with the yarn before sealing with hot glue and cutting off excess yarn. Bend the tail into an "S" shape and hot glue tail to center bottom. Cut heart shape out of felt and glue on for nose. I used twisted paper to make the mouth, but there are so many other material possibilities. For a cool Halloween look, make a bow tie and hot glue onto center neck. Cut off stem wire for whiskers and insert into Styrofoam. What a fun addition for Halloween! Doesn't he look bootiful!!!! I came here through the really crafty linkparty! Como siempre, un trabajo original y creativo. That's just the cutest! I would have never remembered to use a bottle to create that! Thank you for sharing at The Really Crafty Link Party this week. pinned! How cute! What a great wine bottle upcycle idea. Wonderfully creative, Gail. Pinning. Love this I am thinking our kids in our 4H cat project might like to make these for fair. Do you know what size styrofoam ball you used? Was it 4 in?